Have you heard about the puppy potty training sprays? They are designed to help you housebreak your new puppy so that it will not pee or poop where it’s not supposed to in the house. Sounds kind of weird, eh? And kind of like it might not really work, huh? 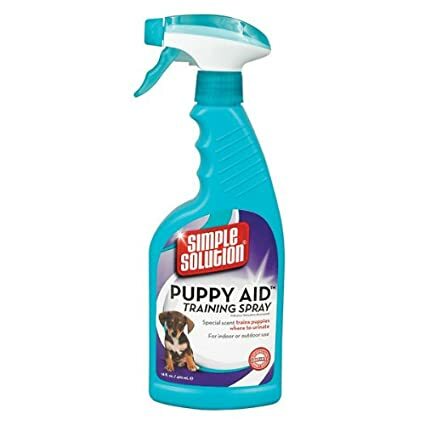 Well, I wanted to see for myself so I did some research to determine if puppy potty training sprays really work or if they’re a scam. Keep reading to see what I found out. Since I was completely new to house training spray for a puppy, I had to read up a bit to learn how it works. Here’s what I found out – the spray is designed to appeal to the puppy’s sense of smell. So, basically when you spray this stuff somewhere, it should be where you want the pup to go potty. Why? Because the smell of the spray is supposed to draw the dog to it when he needs to go potty. How does it do this? Well, the spray itself is made up of some synthetic and natural pheromones that draw the puppy to the area where you have sprayed it. Ideally, this results in the puppy only going to the bathroom in this particular area. It is worth noting that you can get this spray in a traditional pump spray bottle or in a bottle with a dropper where you can leave drops of the liquid instead of spraying it. The important thing to remember when using puppy potty spray is to ONLY apply it to the area where you want the dog to go to the bathroom. This is the only way to create the habit and have the dog peeing and pooping where you want him to. Toilet training spray may damage your grass or carpet, depending on where you plan to use it. For the best result, spray just a little to test it before applying liberally. Pet owners who plan on using this in the home may also notice a strong odor from the spray, so that is something else to keep in mind before using. Based on my findings, this stuff does not really work all that well. It seems that a few pet owners out there do have success with it, but overall the majority of us cannot get it to work its magic. In fact, using some of the puppy pee pads seems to have MUCH better results. I would definitely suggest the the puppy pads over the puppy potty spray. I bought Nature’s Valley, because I was told by the PetSmart associate that it was the best. I have a 1 yr old Chihuahua ! after several attempts with spray that isn’t working, I looked online to see what others had to say. Guess it just depends on your dog. Nature’s Valley had 2 stars ! I’m gonna try another spray that that has 5 stars, hopefully I find one that will work for my baby Dobee. Winter is here and Chihuahuas hate the cold, it snows here. I can’t get My chi to potty on a pad to save my life. I take him out like every damn hour. Do you try the spray and pad together? Here is another post, which provides some steps for you. Maybe you can follow these steps to train your pets pee or poop on the toilet training pad.